Microsoft finally rolled out its massive update to Xbox Live today, and it looks great. 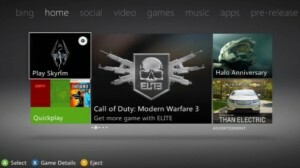 The problem, however, is that it has disrupted many users’ connections to Xbox Live, citing a “connection error”. This error is implied to be user end by the error message, though when I tested my connection, the only stage that failed was to Xbox Live– my console connected to the internet just fine. There’s been no work-around supplied yet by Microsoft, though I know the problem to be at least as widespread as the other side of my homestate, Colorado, courtesy of facebook updates from similarly frustrated friends. Once a fix becomes available, I will certainly post instructions for anyone else experiencing this anomaly. How about the rest of you? Can anyone else weigh in on how far this problem spreads? Update: It seems as though the problem has magically fixed itself, at least here in the Denver Area. Anywhere else? Same here in Oregon….this is BS! I was 3/4 through cowboys & aliens! Thanks for the input, Jake! Now we know it to be a nation-wide problem. I’m experiencing this problem in western Massachusetts.